WASHINGTON — Anyone who has tried to pry information from the federal government may have been surprised on Tuesday by Hillary Rodham Clinton’s assertion that in all her emails in four years as secretary of state she never strayed into the classified realm. After all, a consensus of both Republicans and Democrats for many years has been that the government routinely overclassifies information, reflexively stamping “secret” on mountains of documents with marginally sensitive content. The government classified more than 80 million documents in 2013, according to the Information Security Oversight Office, which publishes an annual count. But some secrecy experts and former government officials on Tuesday were skeptical, noting the interesting turnabout that had a former top official insisting, for once, that none of her exchanges were secret. 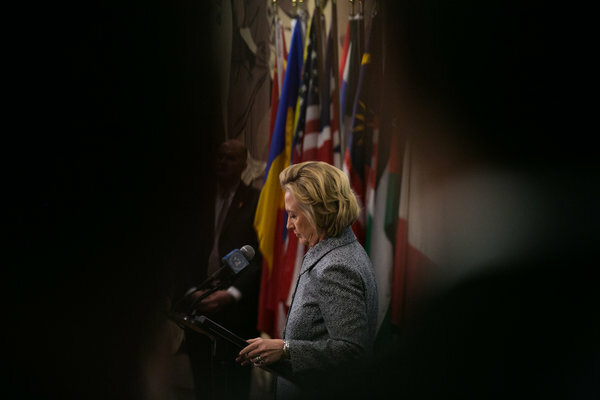 Hillary Rodham Clinton held a news conference to address her use of email while she was secretary of state. Here are some questions she answered, and some she did not. “As a longtime critic of the government’s massive overclassification, I thought it was a refreshing touch that the secretary of state conducted all her email in unclassified form,” said Thomas S. Blanton, director of the National Security Archive at George Washington University. He spoke with a hint of sarcasm — his nonprofit organization has battled the government for decades to overcome classification claims and try to make important official documents public. Mrs. Clinton insisted that she kept classified information out of her email, as the law required. Storing classified information in a personal, nongovernment email account on a private computer server, like the one at Mrs. Clinton’s home, would be a violation of secrecy laws. And relations with other countries are particularly subject to secrecy claims. “Foreign government information” — information received from another government with the expectation that it will be held in confidence — is an official category of classified information in secrecy regulations. A former senior State Department official who served before the Obama administration said that while it was hard to be certain, it seemed unlikely that classified information could be kept out of the more than 30,000 emails that Mrs. Clinton’s staff identified as involving government business. Steven Aftergood, who directs the Project on Government Secrecy at the Federation of American Scientists, said he suspected that if there had been no fuss and a researcher or journalist had sought all of Mrs. Clinton’s emails under the Freedom of Information Act, the answer might have been different. But Mr. Aftergood also noted that as secretary of state, Mrs. Clinton was the top classification authority for the entire State Department, with broad discretion to determine which department documents were classified and which were not. “There’s zero chance that she’ll be charged with unauthorized retention of classified information, because she decides what’s classified,” he said. Clinton aides pointed out other factors that reduced the need to use the personal email account for sensitive matters. 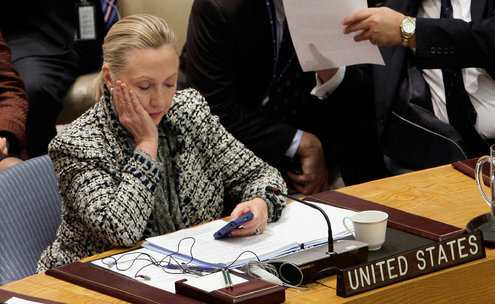 As secretary of state, Mrs. Clinton was almost always accompanied by one or more aides with secure government BlackBerrys, laptops or other devices that could be used to send classified material at her direction. Her office said that while serving as secretary, Ms. Clinton “communicated with foreign officials in person, through correspondence and by telephone.” Her staff’s review of her emails “revealed only one email with a foreign official,” one from the United Kingdom, the statement said. It is rare but not unheard-of for a government official to be punished for storing classified information on a personal device. John M. Deutch, a former C.I.A. director, was pardoned by President Bill Clinton in 2001, sparing him a guilty plea to a misdemeanor charge for keeping classified information on personal, nongovernment computers. Mr. Deutch had already been stripped of his security clearance. More recently, a Marine Corps board of inquiry recommended that a reservist, Maj. Jason Brezler, be dismissed from the corps with an “honorable separation” for mishandling classified information. According to Kevin Carroll, his lawyer, Major Brezler, 35, a New York City firefighter and a combat veteran of Iraq and Afghanistan, accidentally took home 14 documents on his personal computer, some of which were classified. He was in a graduate school class when he received an urgent email from military officials in Afghanistan and sent a specific document in response, using his personal email account, Mr. Carroll said. The document was classified, and that led to an internal review, the lawyer said. Major Brezler has sued to challenge the separation recommendation, which goes to the Marine Corps commandant and then to the secretary of the Navy. The case is pending in federal court in Brooklyn.